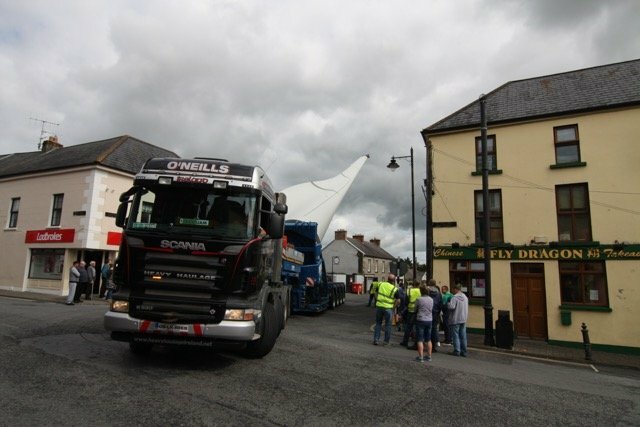 This week’s picture(s) features the only heavy-haul, low-loader trailer in the world being used to transport six Wind Mill blades a 14.3 km journey from Littleton to Killenaule in County Tipperary. The special task was carried out by Michael O’Neill & Sons, Hospital, County Limerick with its Scania R620 V8 8×4 tractor-unit towing the Vossen trailer. “Obviously, the blades could take the tight corner in the village, so with careful planning, etc., this trailer was used to reverse the blade around the corner and continue in reverse approx. 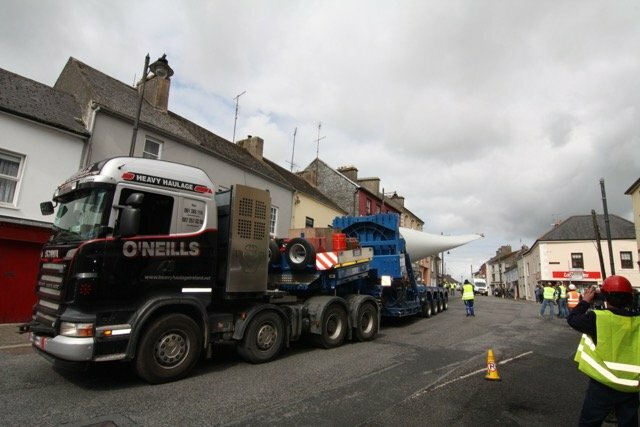 1 km and then do a U-turn to continue on to the Ballinacurry Wind Farm,” explained Jimmy O’Neill.